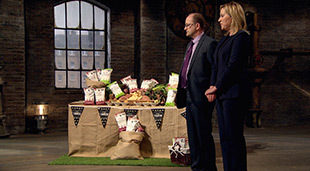 Tonight (20 July 2014) sees the start of a brand-new series of Dragons’ Den. Every week, we’ll be blogging about IP issues we spot. This week, we discuss setting up a franchise, creating a strong brand, and more. Scott Cuepit hoped to secure £65k for a 10% stake in his dance company Swing Patrol. Having already protected the company name and logo [EU011218203] the Dragons agreed the best way to develop the business would be though franchising. A franchise means giving rights to an individual or group, to market the company's goods or services within a specific location. This can be a great way of making money from something that you already own. Scott’s pitch tempted 3 out of the 5 Dragons to make an offer. In the end he decided Deborah Meaden and her Strictly Come Dancing experiences would make the perfect partner for him. He danced his way out of the Den having agreed to her investment of all the money for a 20% stake in the company. Claire and John Brumby pitched their industry award winning ‘cool brand’ next. They were looking to tempt the Dragons to invest in Scrubbys - their business producing vegetable crisps. Claire and John Brumby pitching their award winning ‘cool brand’ Scrubbys to the Dragons. A brand is much more than this though. It can also be a ‘promise of an experience’ and helps to give consumers certain assurances about the nature of the product or service they will receive. On the other side it also promotes standards the supplier or manufacturer seeks to maintain. Duncan Bannatyne saw the opportunity in investing in this brand but only offered half the investment. As the rules of the show state that the full amount for investment must be offered, the couple walked away with nothing. Jennifer Duthie and her host of little assistants were next in. She was looking for an investment in her shoe business Skribbies making customisable children’s trainers. Peter Jones wanted to know how Jennifer was making sure that no one would copy her ideas. Although someone could make shoes in the same material as her, Jennifer does have a registered design to protect the look of the hightop trainers. Registering your design gives you exclusive rights for the look and appearance of your product. The existence of your design registration may be enough on its own to stop others from trying to exploit your design. If it does not, it gives you the right to take legal action to stop them exploiting your design and to claim damages. As well as protecting her design, Jennifer has protected her brand by registering a trade mark UK00002651895. This will help to differentiate her product in the very overcrowded children’s clothing and footwear market. The strong design and distinctive brand convince Piers Linney and Kelly Hoppen to offer half the money each and Jennifer is the second successful entrepreneur to leave the Den. Jake Hayman and Joe Kenyon were last up to face the Dragons, pitching their online picture framing business Frame Again. When you have a business that operates on line like this one it is important to be sure you know who owns the content on your website. It will be owned by somebody – if this is not yourself or your business then you need to find out who it is and whether you have the right to use it. If you hire a subcontractor to build a website on your behalf for instance then they will have ownership of it. You need to ensure that you put a contract in place before commissioning anything to explain that the copyright ownership will transfer to your business on completion of the work. Did you know that 74% of businesses cannot correctly identify the owner of copyright when using a subcontractor? Don’t get caught out by this! These 2 entrepreneurs seem to be IP savvy however and have protected their brand by applying for a trade mark UK00003046566 . Ultimately it was the design of the frames which stopped the Dragon’s investing. They might’ve left the Den without an investment they did manage to take a quick selfie on their way down in the lift to capture the moment! If you would like to find out more about any of the IP mentioned in this blog and the ways in which it might affect your business, our free to use, fully interactive, online tool IP Equip is a great place to start.